Sound Resolving and accurate; high level of dynamic realism; "does exactly the job asked of it -- retrieve the source information and pass it through with only volume changes." Features Cool-looking illuminated Plexiglas panel with on/off switch; separate internal areas for line stage, phono stage, and power supply; moving-magnet phono stage adds $600 ($850 after initial purchase); 24k gold knobs, buttons and trim rings add $500. Use After-market Hovland power cord makes HP-100 a touch more clear and detailed. Value The best piece of audio equipment Todd has heard; the HP-100s level of physical and musical beauty usually come at a much higher price. When I say "Hovland," what comes to mind? If its capacitors, tonearm wire, or power cords, were starting from the same place. Thats why I was surprised when I entered their room at CES 98 and, instead of a static display of caps and wire, I saw a system with a Dodson DAC driving a Hovland preamp, which was hooked to a Hovland power amp. The speakers were Merlin VSM-SEs, and the sound was glorious -- detailed, resolving, utterly transparent and very dynamic. Since I had previous experience with both the DAC and speakers and knew them to be very revealing of system synergy, it followed that the Hovland components, as unknown as they were, must have been of high caliber. Move forward a year. When Marc Mickelson asked if I wanted to review the Hovland HP-100 preamp, having had a taste of it capabilities, I did everything but drive to California to pick it up. Actually, once I told Marc Id do the review, Hovland called and arranged everything, even sending along two of their power cords -- one for the preamp, and one for my amp. At $538 for a six-foot length, the power cord is not included with the preamp. Hovland suggests that to get the absolute best from the preamp, the cord is recommended, but they also say that the stock cord does a superb job. I agree. I spent most of my listening time with the stock cord in place and used the Hovland power cord only towards the end of the review. The difference was easily audible and important, but had I never heard the add-on cord, I would be more than happy with the stock one. But now Im drifting. Back to the story. The HP-100 is, in Robins words, "the best looking thing youve ever had in here." Shes right. And as shallow as this will make me sound, when I spend $3995 for a product ($4595 with phono stage, which can be added later for $850), looks count. The black nickel chrome-plated fascia sets off the large chrome control knobs perfectly (optional 24k gold knobs, buttons and trim rings add $500 to the price). Immediately behind the faceplate and wrapping around the entire circumference of the preamp is a quarter-inch translucent Plexiglas plate. When the preamp is powered up, a blue light shines through the Plexiglas, projecting onto the ceiling, side walls and equipment rack. There is a switch on the rear of the unit to turn the light off, but why anyone would use it is beyond me -- the look of the lighted preamp is both more understated and more beautiful than words can convey. The rest of the preamp is finished in a highly polished black powder coat with countersunk screw mounts that finish the look perfectly. Volume is controlled via a 31-position silver-contact attenuator, with 2dB steps, using Holco resistors. In all the time I used the HP-100, I never had difficulty finding the exact volume I wanted, but, as with all stepped attenuators, your mileage may vary. In addition to the volume control and source selector, the fascia has a balance control (1dB steps, and out of the circuit when not engaged), the on/off button, a mute button and a stereo/mono switch. The preamp is tube-based, using two 12AX7 tubes and a 12AU7 in the line stage (which provides 14dB of gain) and two 12AX7s and a 12AT7 in the optional phono section. On the back of the fully loaded HP-100 are seven single-ended line inputs, a tape loop, a moving-magnet phono input and two sets of single-ended outputs. The choice of moving-magnet only for the phono stage may strike you as unusual, as it did me. At CES 99 I had the chance to ask Bob Hovland and Alex Crespi (Hovland's director of sales and marketing) about the company's choice. The answer has several dimensions. First, Bob Hovland feels that the best MM cartridges offer superb performance, which allows them to more than hold their own with comparably priced moving-coils. Second, Hovland, the company and the man, feel that a step-up transformer is the right way to design for a moving-coil cartridge. And third, to get sufficient gain for an MC, an all-tube driver is too noisy. Hovland is currently working on an outboard MC step-up, which the company expects to have ready by years end. As for the rest of the specs, at 18.25"W by 14.6"D and 5"H, the HP-100 is a rather standard size. Internally, the construction uses a monocoque frame that separates the chassis into three sections -- one for the power supply, one for the line stage, and one for the phono stage. The result is an extremely stiff chassis that also provides superb magnetic shielding. Tour over; lets get to the sound. The unit I received for review was well broken in and so went right into the main system. From the get-go what I heard confounded my expectations. The old setup -- Theta Miles as a transport, Dodson DA-217 Mk II DAC, BAT VK-3i preamp, Blue Circle BC6 amp, Merlin VSM-SE speakers and wire by Cardas and Audio Magic -- was composed of parts I know well, both individually and as a set, and which as a whole make for a superb reference (and music) setup. So changing out the excellent BAT preamp for the Hovland should have made, at most, moderate differences. It didnt. OK, if held at gunpoint I would probably say that the change was no more a 5% or so improvement. But remember, this is in a system that is already at least 90% of the way there, if not more. And best of all, the improvement was across the board. Seemingly, every system weakness was addressed and every system strength was made even better. As a reader of reviews -- as well as writer -- I find the previous paragraph, and especially the last sentence, a bit over the top. You too? I hope so. Rave reviews are as common as insipid Kenny G songs. Every one you read (or hear) is exactly like the last. Well, Ill try and vary the tune a bit -- for a couple of reasons. First, Im not that kind of guy. When something really excites me, I want you to know it, and know why. But I also want to fully describe it so that you can decide if it deserves a place on your must-audition list. And second, if I launch into the typical, "I heard details I never knew existed" or "It changed my life and it will change yours" review, what is so special about the Hovland will get lost in hyperbole. Another problem with the seemingly endless stream of rave reviews is that valid descriptions become clichés. And when those descriptions/clichés are used to describe a component, that components real worth can be obscured. Well, taking that risk anyway, I can say that the HP-100 fulfilled several clichés in my system. First, it really did remove layers of grunge from the virtual window on the music. And while this didnt bring new detail to view, what it did was flesh out the sonic picture so clearly and so completely that old detail displayed added nuance. And, best of all, the added nuance was both informational and musical. By way of explanation, the vibrato in sax sounds was enriched, taking on near tactile levels of reproduction without becoming detail for its own sake or dominating the sonic picture. The sounds that naturally accompany piano playing -- the squeak of the chair, the sound of felt hammers on steal string, the sound of fingers on keys (and in the case of Keith Jarrett, the grunting that hovers 18 inches off the keyboard), were enhanced, but in the context and service of music. Another way to describe this is to say that the texture of each detail on a recording was accurately reproduced, and that this texture gave a richness, vividness and naturalness to every recording I played back using the HP-100. The second fulfilled cliché is that this increased resolution and accuracy made musical enjoyment and insight far easier. For example, Robin has often been confused by my fascination with Joni Mitchell. With the HP-100 in, Joni was fully revealed for what she is: a diarist who sees the world with the eye of a painter. Silence is her canvas and she paints sounds across it as she reads aloud from her journal. Listening to "In France They Kiss On Main Street" from The Hissing of Summer Lawns [Asylum 1051-2], the excitement of the night, of challenging and daring convention, and of joy of love for the physical pleasure it brings is painted in the rhythm, the tonal palette used, and the percussion of the song. The lyrical directness tells the rest of the story, and the HP-100 unravels it all with unparalleled skill. With this preamp as the only system change, Robin finally got it. Next up, the HP-100 set new benchmarks for dynamic realism at the Warnke Lodge and Music Spa. It is not forward or aggressive at all, but when called upon the Hovland will kick hard -- very hard and very convincingly. Any decent preamp can do rock or blues dynamics easily enough. But the real test of full-scale dynamics is still classical music, and my favorite dynamic test is Mahlers Sixth Symphony, in particular the Bernstein/VPO 1986 version [Deutsche Grammophon 215076]. The schizoid opening has everything from pizzicato strings to roaring brass, a perfect test of dynamic control and nuance, and one that the HP-100 passed without a chirp, squeak, squeal or protest . The end of the piece has the famous coffin lid clanging shut, which is also a major stress test. Most components, in attempting the dynamic impact this calls for, collapse the soundstage or smear transient edges. Not the Hovland. The stage stayed anchored in position and transients were perfectly delineated. as perfect as Ive heard -- extended, delicate, and able to stand out without being harsh, brittle or forward. The stage with the HP-100 in use began right at the plane of the speakers. Width extended beyond the speaker position, while depth was excellent, but not as deep as that generated by the Joule-Electra LA-100 Mk III. Layering was so smooth and natural that it succeeded in the best way possible, by never calling attention to itself. In all, the Hovland HP-100 creates a stage that is involving, clearly rendered, and accurate. When I mounted the Roksan Corus Black that dB sent, what I heard was indeed great performance. Before listening to the Corus through the HP-100, I put the BAT VK-3i back in for several days and listened to analog exclusively. After I reinserted the Hovland preamp, what I heard was consonant with my experiences with the line stage alone. A final phono comment: the phono stage is not exactly MM only. The HP-100s manual states that it is capable of handling cartridges with outputs as low as 1.0mV. The manual also specs the phono stage as having 46dB of gain, so Im not sure I entirely agree with the 1.0mV rating. I would suggest that 2.0mV would be a more reasonable output, but in systems with greater sensitivity, the 1.0mV rating may be correct. In all, the HP-100 not only fulfilled clichés and expectations, it slew them. The unknown Hovland preamp, in my system at least, performed in excess of what I had previously thought my system was capable of. And as for those differences I mentioned earlier when using the add-on power cord, with it in place the HP-100 became ever so much clearer and detailed. Would I say that the cord is worth a 15% premium? In a fully actualized system, most certainly, as the difference is both clearly audible and very beneficial. But as I said earlier, the HP-100s out-of-the-box balance and skill does not mandate the use of the add-on cord. Ive been privileged to have several reference quality preamps through here of late. The $8450, full function Thor TA-2000 and the $3495 line stage only Joule-Electra LA-100 Mk III, are the best of those. Working from memory (sadly, my poor budget wouldnt let me buy either of them), the Hovland strikes a balance between these two superb preamps. The LA-100 has a greater sense of detail retrieval, but it didnt seem to balance that detail with the musical coherence of the HP-100. The Thor offers greater liquidity, but to me the Hovlands vivid rendering is more lifelike and musically satisfying. I dont want to push these comparisons too far, though, because it has been a while since I listened to either the Joule Electra or Thor preamps. The just-about-half-priced BAT VK-3i ($1995, line stage only, $2495 with phono) is my real-world reference preamp. It offers balanced (no pun intended) and organic performance coupled with features that make it as versatile as any preamp on the market. It is my first recommendation for anyone with a budget from $2k to $4k, but the Hovland is clearly playing a different game. Performance-wise, the BAT scores well in several areas when put up against the HP-100. 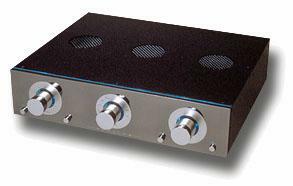 It is almost as quiet as the Hovland preamp, and offers an MC phono stage as well as a remote. It renders a balanced sonic view, and has superb tonal characteristics. On the other hand, it is dynamically constrained when compared to the HP-100, and the aural images it draws are not as vivid or as vital. The Hovland really does offer all the considerable sonic skills of the BAT and extends each, while addressing every perceived weakness of that preamp, which include its comparative diminution of clarity and large-scale dynamics. I cant properly describe how I feel about the HP-100 as the sum of its parts. The only negatives I can attribute to it are that it lacks an MC phono stage and has no provision for remote control. To a lot of people these can be serious issues. As for me, if I have to adjust to them, I will because what the HP-100 has is the most vivid, vital, natural, involving and balanced presentation Ive ever heard. It has delivered more music and more emotion to my room than I felt was possible. It has helped me get more out of the rest of my system than I thought it was capable of. In short, it has changed my concept of what a preamp can do. In the end the HP-100 is a sort of anomaly. My previous preamp experiences led me to believe that the serious bend in the price/performance curve lay right around the $2500 price point. Now I think that while the bend may still be at that point for most preamps, the Hovland, at about twice that price, offers a stunning leap in performance. For $4595, it offers priceless musical insights, and has looks to match There is no way Im ever going to call any component perfect, but I will say this: The Hovland HP-100 is not just the best preamp Ive heard, it is the finest component of any type that Ive had in my audio system. And that makes it, at any price, a steal. While Im sending this one back, the good news is that Robin has already given her permission to save for up for its sister. Look for a return engagement soon. Price: Linestage-only version, $3995 in chrome, $4495 in 24k gold trim; linestage with phono, $4595 in chrome or $5095 in 24k gold trim (all prices in USD). Warranty: Two years parts and labor (90 days on vacuum tubes).